Inside the Apple: What's a Gustavademecum? As we enter the week in which Americans spend more on food than any other (including $875,840,000 on turkey alone), our thoughts turn naturally to dining. 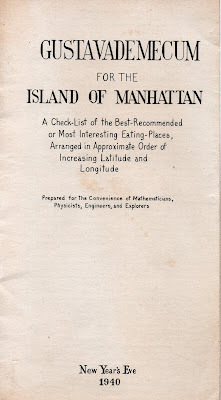 We were combing through the Inside the Apple archives the other day, when we came upon this charming little booklet from 1940: the "Gustavademecum for the Island of Manhattan," a sort of scientifically-minded forerunner to Zagat. 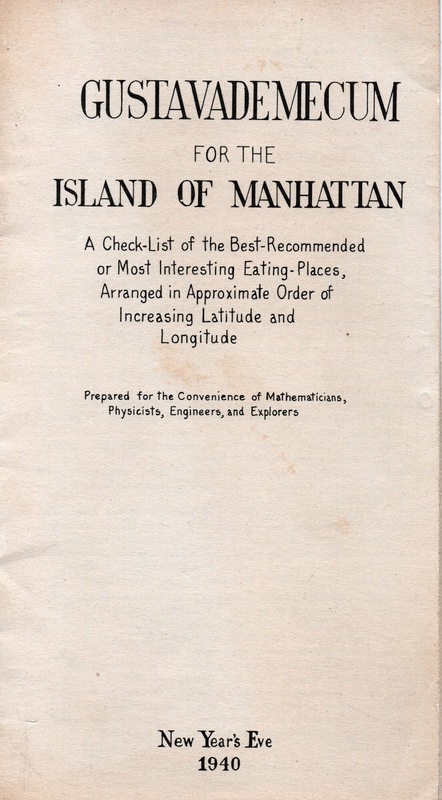 As the cover notes, the booklet was "prepared for the convenience of mathematicians, physicists, engineers, and explorers," and it's a small wonder. For those whose Latin is a little rusty, "Gustare" is to taste and "vade mecum" literally means "to go with me" but colloquially refers to a handbook. Thus, a Gustavademecum is a tasting handbook. L=general illumination, measured in lumens per square foot or foot-candles. When L=0.1, menu is just legible. L=1, one wax candle one foot distant. L=200, north window at noon, January 1. N=noise level, measured in decibels. N=20, country house, no children. N=50, conversation intelligible at 3 feet. N=70, shouting level. For most entries in the book, all that is provided is the address, type of cuisine, and price of the least expensive meal. 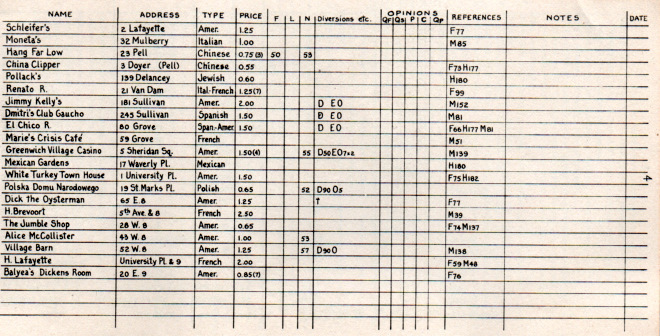 All the other data was to be filled in by the user. One of the most complete entries is the Greenwich Village Casino which has D50EO7x2 -- that means it had a 50-square-foot dance floor, entertainment, and two, seven-piece orchestras. The least expensive restaurant in the guide is the Actor's Kitchen at 229 West 48th, where dinner was just 35 cents. (As the name suggests, the Actor's Kitchen existed to provide cheap meals to working actors.) The priciest entry is The Colony at 667 Madison, where the least expensive meal was a three-course dinner for $4.00. The Colony--which first became known as a gambling den--will be the subject of a future blog post. Perusing the list of eateries, most are now gone. Some old favorites are listed such as the "21" Club, Fraunces Tavern, and Tavern on the Green, but most of these restaurants are now just a dim memory. On the page excerpted above, the only place we recognize that's still going is Marie's Crisis, the venerable West Village piano bar. However, the ghost of Moneta's at 32 Mulberry Street is still hanging around. If you go to this block of Mulberry (just north of Mosco Street, opposite Columbus Park), you can see the faint trace of Moneta's sign on the facade of 32 Mulberry, revealed when the bar Yello went out of business and its awning was removed. In the coming weeks, we'll research some of the old restaurants in the Gustavademecum and post our findings. 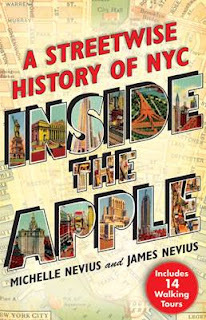 Is there any old New York eatery you wish you knew more about? Let us know.